I've been guilty of looking at business as a metaphor for education many times. I think there are some ways it works okay. We can learn from the business community and certainly need to work closely with business partners. We have some shared interests in good education outcomes. I enjoy reading books from business and a whole variety of areas and applying principles I learn to my work as an educator, where appropriate. But we have to be very careful with comparing education to the business model. Our mission should be to advance the human condition. 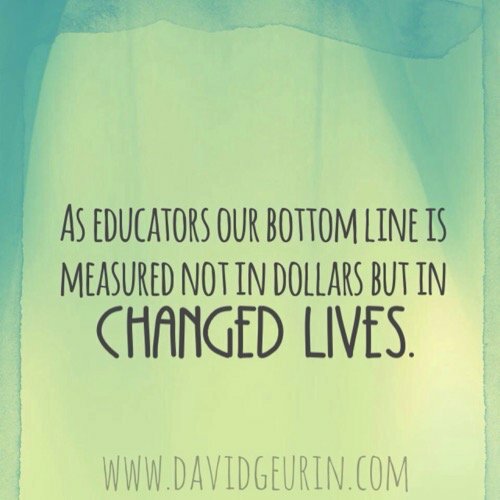 Our measure of success as educators is changing lives and creating opportunities. And making our democracy stronger. In business, the bottom line is ultimately measured in dollars and cents. But you can't reduce a child's education to increased profits. The business metaphor is especially dangerous considering the current political and policy landscape. There are many who would like to privatize education. Better schools, goes the thinking, would result from competition and the marketplace. Capitalism would do it's thing and education would be stronger for it. But that model has proven failed over and again. Learning is not a commodity. I've also been guilty of referring to students as customers. When I've done this, it is making the point that we should provide good customer service. Our students are the end users of what we do, and we should carefully consider their experience and how school is working for them. But this comparison only works to a degree. The relationship between a business and a customer is transactional. The customer doesn't own much responsibility in the relationship. The customer pays for goods or services and expects the business to do the rest. But schools need to go beyond treating students like customers. We must make students partners in learning. We are not just delivering learning to students like a product. We must co-create learning with students if it is to be most effective. It requires a degree of pulling together and helping students to contribute to their own learning. Metaphors are generally helpful to try to understand the world in deeper and more meaningful ways. 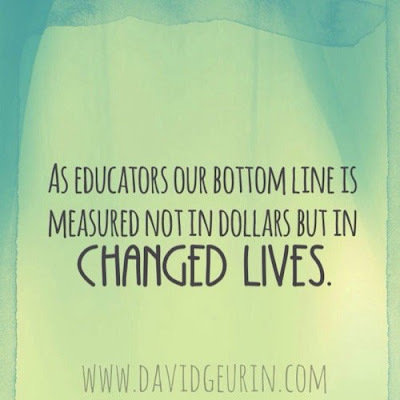 But as educators, we have to be careful about comparing what we do to what businesses do. Can we learn from business? Yes! But should schools entirely operate as a business model? I think not. Question: What are your thoughts on schools as businesses? And students as customers? I want to hear from you. Leave a comment below or respond on Facebook or Twitter.